Little bigot, do you want to dance? 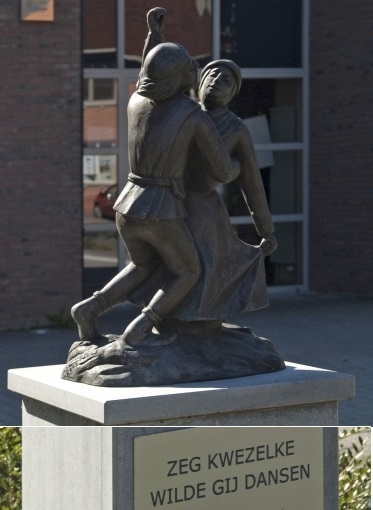 "Say ye bigot wonna dance” is a folk song from 1848, mainly known in Flanders, Brabant and the Netherlands. The cheerful tune is a satirical song that pokes fun pious females (bigots, nuns). The singer is trying to seduce a kwezeltje to dance but each bid the kwezeltje rejects, except the last... The song was covered in 1994 by Sam Gooris. Say, bigot, you wonna dance? I will give you an egg. Well no, I don’t said the bigot. Of dancing I am free. I' and may not dance. Dancing is not our rule. I will give you a cow. Of dancing I get tired. I will give you a horse. it 's me not worth to dance. I will give you a man! Well, yes, I said the bigot. "I'll dance all I can.